We are 30 mins from Dover, 30 mins from Bennington and 20 mins from North Adams. All our rooms are now only $50 per night, we also have weekly and monthly rates available. We are pet friendly dogs only please. 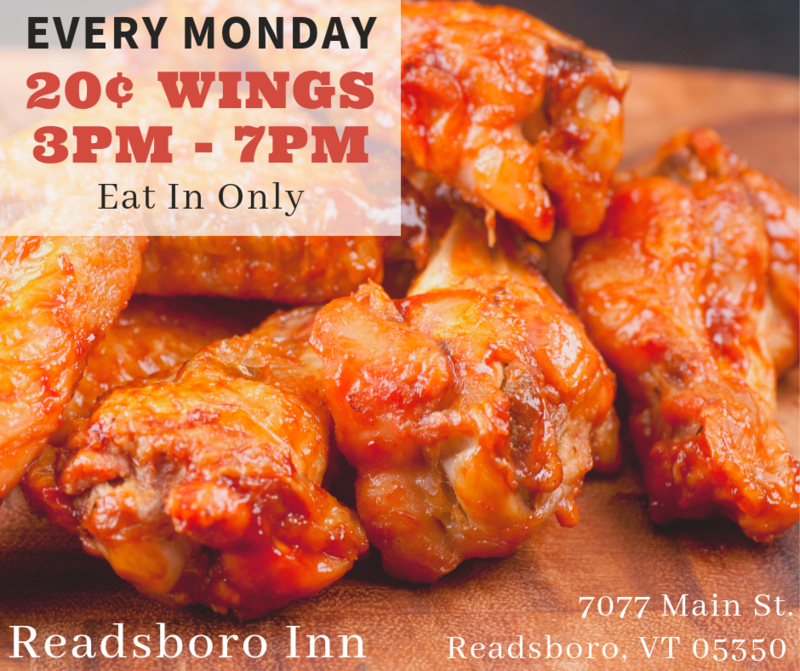 The Readsboro Inn is open 7 days a week and serving a full menu from open to 9 pm. We are located 30 minutes from mount snow and 20 minutes from Berkshire east ski areas. We have several rooms we rent out nightly, weekly or monthly. Summer time bring the white water rafters and fisherman to the are along with vacationers. We have a fine dinning area along with a bar room area with games and a pool table. We have a room that can be rented out for partys or what ever you would like to do with friends and family. Join us at the Readsboro Inn as we kick off Super Bowl 53 with a huge party and lots of free give – a – ways through out the game. We will have the game on all 4 of our big screen TV’S and cheering on our favorite team. $2.50 bud light draft beer. .50 cent wing special all day. Super Bowl LIII, the 53rd Super Bowl and the 49th modern-era National Football League championship game, will decide the league champion for the 2018 NFL season. The game is scheduled to be played on February 3, 2019 at Mercedes-Benz Stadium in Atlanta, Georgia. This will be the third Super Bowl in Atlanta, having previously hosted Super Bowl XXVIII in 1994 and Super Bowl XXXIV in 2000 at the Georgia Dome. Everyone one will be given a ticket at 630 when the game starts for a drawing on a big screen TV at 830. For our Tuesday night pool league we will be giving everyone a ticket every week that will go into a jar. Starting this Tuesday 2/5 6:30 pm. Time can be changed if everyone wants. Every 8 weeks we will draw a ticket and the person will win a gift basket full of pool playing accessories ect valued at $100. From gift certificate’s to sticks and carrying bags ect. The more you play the better chance of winning. Also we will be giving away a free pizza each week to one player. Redeemable on Wednesdays.